Physical Characteristics: Up to 24 inches in length, 2 – 4 lbs., with 50 – 70 inch wingspan. Mostly white heads with brown stripe through eye. Wings are brown on top and mostly white underneath, with long yellow talons adapted for hunting fish. Diet: Strict diet of fish; occasionally preys on rodents, rabbits, hares, amphibians, reptiles and birds. Habitat: Prefer elevated and open nesting sites free from predatory mammals. 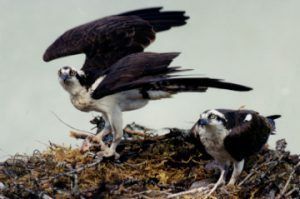 Site must provide feeding ground/fish supply within 12 – miles of nest. Gravitate towards shallow fishing grounds, including rivers, streams, lakes, reservoirs and marshes. Known to build nests on tops of pedestrian bridges, telephone poles, and flat platforms, as well as live/dead trees. Range: Widely distributed raptor found throughout U.S. Regularly observed in Clearwater Basin and throughout Northern Rockies, particularly in summer (breeding season) due to proximity/abundance of prey. Reproduction: Nests generally built from sticks and lined with bark, sod, vines and grasses. Males collect most of materials; females arrange it. Tend to return to same nest year after year. Clutch size 1 – 4 eggs; incubation period 36 – 42 days. Threats: Populations crashed between 1950s – 1970s due to pesticides but significantly rebounded since. Pesticide bans (DDT) have aided recovery. Miscellaneous: Alternative names include fish eagle, sea hawk, river hawk or fish hawk.